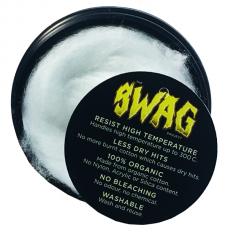 The SWAG Project Cotton is 100% Organic Cotton fibre which was created for vapers by vapers. The cotton fibres “wick” incredibly well without the need of a “break-in” period. The fibres were formulated to withstand continuous high temperature vaping and will NOT collapse under any circumstance. Washable – Wash and reuse. Cotton Bacon Prime by Wick & VapeAvailable online or collect from our Birmingham U.K. E-Cig Stor..